Toshiba America Electronic Components (TEAC) has announced what it says is the industry's first single-chip wireless power receiver (RX) that can operate at 15 watts and is compliant with Qi v1.2, the wireless charging standard. Compared to TEAC's previous wireless power chips, the new TC7766WBG triples the amount of power that can be received without increasing the chip's size. TAEC's new 15W wireless charging receiver IC. The Qi charging standard is the most popular wireless charging standard today. The new 15W chip includes all the functions needed to construct a standalone wireless power transfer RX system, TEAC said. The chip is also compatible with Toshiba's current TB6865AFG 5W transmitter (TX) IC and its upcoming 15W TX IC, which also complies with the Qi v1.2 standard. In addition to its 15W maximum output power, the RX chip features maximum output current of 1.7 amps and output voltage range of 5 to 14 volts, full protections, and the new Qi Foreign Object Detection functions, which keeps metal objects near a charging device from receiving the electrical voltage. 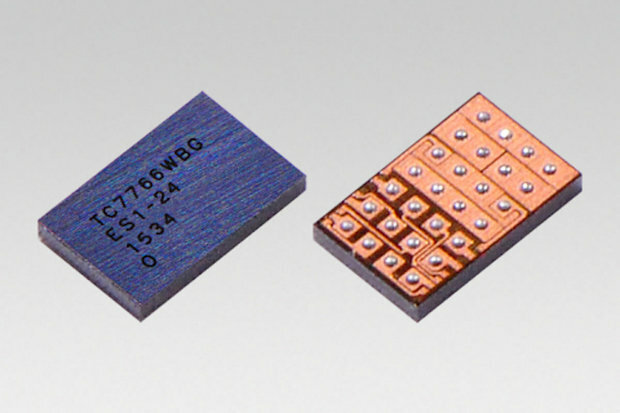 The chip is housed in a WCSP28 package that is 2.4mm x 3.67mm x 0.5mm in size. Samples of the TC7766WBG wireless power receiver IC will be available by the end of 2015, with mass production expected to begin in spring 2016.